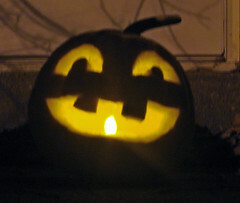 Pari and I carved the second of our five pumpkins tonight. While taking it back out to the front stoop I realized that the first one we carved had standing water from this week's rain. In the future I must remember to make a drain hole in the back. On the plus side, it looks really cool with the battery operated tea light inside, has the candle like flicker, and no scorched pumpkin lid!